Under the Action 13 Minimum Standard, jurisdictions have committed to foster tax transparency by requesting the largest multinational enterprise groups (MNE Groups) to provide the global allocation of their income, taxes and other indicators of the location of economic activity. This unprecedented information on MNE Groups’ operations across the world will boost tax authorities’ risk-assessment capabilities. The Action 13 Minimum Standard has been translated into specific terms of reference and a methodology for the peer review process. The peer review of the Action 13 Minimum Standard is proceeding in stages with three annual reviews in 2017, 2018 and 2019. 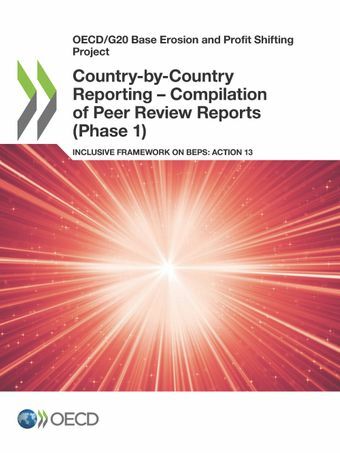 The phased review process follows the phased implementation of Country-by-Country (CbC) Reporting. Each annual peer review process will therefore focus on different aspects of the three key areas under review: the domestic legal and administrative framework, the exchange of information framework, and the confidentiality and appropriate use of CbC reports. This first annual peer review report reflects the outcome of the first review which focused on the domestic legal and administrative framework. It contains the review of 95 jurisdictions which provided legislation or information pertaining to the implementation of CbC Reporting. Ce recueil inclut les versions en français des rapports d’examen des pays francophones suivants : la Belgique, le Bénin, le Cameroun, la Côte d’Ivoire, la France, le Gabon, Haïti, le Luxembourg, la Principauté de Monaco, la République démocratique du Congo, le Sénégal et la Suisse.